I sometimes agree with N.T. Wright and often disagree with him. He has the kind of mind that challenges one’s thinking, even when you think you ‘know’ he’s wrong about something. As I do with any of N.T. Wright’s books or articles, I go in with eyes and ears wide open. Dr. Wright is a brilliant academician. He has taught at Cambridge, McGill, Oxford and Harvard universities, and is currently research professor of New Testament and early Christianity at the University of St. Andrews in Scotland. He was at one time Bishop of Durham, Canon Theologian of Westminster Abbey, and Dean of Lichfield Cathedral. Wright is a prolific author of more than 30 books and travels the world speaking at major conferences. However, the question with any of his writings is not about his brilliance or his active schedule, but his accuracy. Is Dr. Wright right? Maybe he is or maybe he isn’t, but one thing we can count on with any of his writings is that we will find both our minds and hearts challenged by his. That leads us to the ‘newest’ book by N.T. 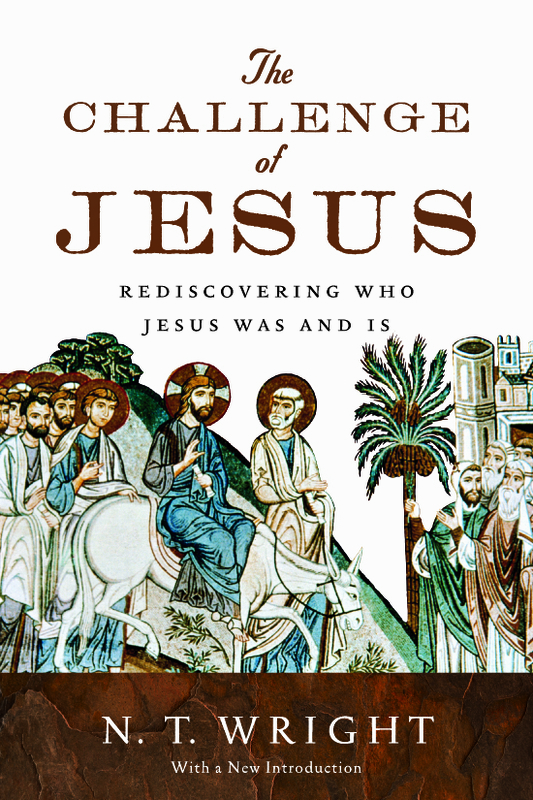 Wright – “The Challenge of Jesus: Rediscovering Who Jesus Was and Is” – released earlier this month. I qualify calling this Wright’s ‘newest’ book because it is an updated version of a book he wrote in 1999 (InterVarsity Press). So, is there any benefit to reading a 15-year-old book with an updated introduction to the new edition? I think there is. The most immediate benefit for many may be that they did not read the 1999 edition of the book. However, even if you did read the original, you may find the new edition a good intellectual and spiritual exercise. I do have some reservations about parts of the book, which I will address briefly soon. First, the purpose of this edition. My wife and I visited New York City in April of 1999 and we remember admiring the size and strength of the Twin Towers that were destroyed less than three years later. I found myself thinking as I read The Challenge of Jesus how much things have changed in our world since the book was first published in October 1999. It was helpful to remember that Dr. Wright first delivered these words to an audience of more than a thousand graduate students and university professors in a very cold, snowy Chicago in early January 1999. Perspective aids understanding. I think some Christians will feel uncomfortable with the first part of Dr. Wright’s book. I struggled with some of his views in the early chapters, but appreciated efforts in the latter. I especially liked the chapter about the resurrection of Christ from the aspect of the ‘apologetics’ of Jesus rising from the dead after being brutally beaten and crucified. As we will soon see, the Christian worldview succeeds or fails on the back of the historical reality of Christ’s resurrection from the dead. Since we are just days away from Resurrection Day 2015, I’d like to point to Wright’s perspective about Jesus’ death and resurrection. Dr. Wright emphasizes the importance of understanding historical events in light of how people of the time period would have understood the reporting of those events. That’s an important method to grasping the full impact of the Bible. The Apostle Paul made it clear in his first letter to the Corinthians that the resurrection of Jesus Christ was at the heart of the Christian worldview from the beginning. Here is Dr. Wright’s perspective about the resurrection beliefs of the early Church. Dr. Wright concludes the chapter by saying the resurrection narratives of the Gospels are clear on three points. Wright does not believe that the Gospel accounts of the resurrection represent a late development in the tradition. He also does not believe that the resurrection narratives in the Gospels are derived from other literature. I especially agreed with this statement at the end of the chapter because it is at the heart of the Christian worldview. It is amazing to realize there were people in the church only a couple of decades after the resurrection of Jesus Christ who were saying there was no resurrection of the dead. That certainly must have been a major concern for leaders of the Corinthian church who brought Paul news of many conflicts, divisions and wrong beliefs within the church. Paul wasted no time in addressing each of the concerns and met the greatest of them head on at the end of his letter. There is, of course, much more to the book than just this one chapter, but at this special time of the year when Christians around the world are focusing their attention on remembering the greatest days in the history of the Church, the sacrificial death and glorious resurrection of Jesus Christ, we can agree with Dr. Wright that we need to take seriously what we believe and why we believe it. I’ve always had a bit of trouble with the logic here. I see no reason why God could not have raised Christ specifically as a one time event. It does not follow that God would have to raise any others, in a general sense. That’s the nature of miracles: they do not generalise in the manner that Paul indicates in this verse. I think that any atheist reading this would find the argument weak. Paul links this to his whole chain of reasoning. So if the first link is not a good one, then the rest of his argument can be discarded. Of course, we have many, many reasons to have strong faith, despite what I see as Paul’s ineffective argument here.